WELLS, Tex. — The first construction workers to arrive at TransCanada’s Keystone XL construction site on Monday morning found climbing ropes tied to their equipment. Three protesters had hung platforms from pine trees, hoisted them 50 feet into the air and secured them to TransCanada construction equipment. Then they had shimmied up. The equipment could not be moved without pulling the protesters out of the trees. 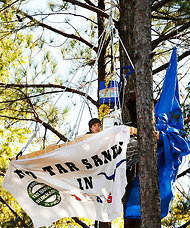 A protester occupied a tree along the route of the Keystone XL TransCanada Pipeline during an October demonstration by the Tar Sands Blockade. Sections of pipe in Sumner, Tex. At another site down the road, workers found four protesters kneeling on the pipeline easement, their arms locked through the treads of two bulldozers. It is a scene that has become common in East Texas in the last two months. Since September, when construction began on the Keystone, the Tar Sands Blockade, a grass-roots coalition of East Texas landowners and environmental advocates from across the country, has been waging a nonviolent guerrilla campaign against the pipeline. About every week since construction began, blockade volunteers have locked themselves to construction equipment in protest. So far, 43 have been arrested. But on Monday, protesters who were not locked to equipment were pepper-sprayed as well, the first such incident, according to Ron Seifert, a spokesman for the Tar Sands Blockade. The protesters have come from across the country. Some are young activists from the coasts, veterans of the Occupy movement and other environmental campaigns who believe that developing the Alberta tar sands will seriously aggravate climate change. Many are locals angered by what they see as TransCanada’s highhanded treatment of landowners. TransCanada has attracted particular ire for its use of eminent domain to take easements from landowners who did not want to sign. Many landowners who eventually did sign say they did so out of fear of having their land seized otherwise. The widespread landowner resentment has created a fertile ground for the blockade’s resistance to the pipeline. The protests on Monday took place with the support of the landowners whose property the easement crossed. TransCanada has fought back against the protests by hiring off-duty police officers to patrol its pipeline easements, arresting any trespassers. (That has included, in one case, the owner of the land the easement went through.) The company has also filed civil suits against protesters and the landowners who have supported them. When TransCanada’s construction workers found the protesters on Monday, they called the police. Deputies from the Cherokee County Sheriff’s Department arrived at the site where the four protesters were locked to tractors and asked them to unlock themselves. When the protesters refused, the deputies administered pepper spray. After the deputies cut the first pair free, they moved them over to a backhoe, where they left them for more than an hour while they tried to free the second pair. Unable to do so, they pepper-sprayed the second pair until they unlocked themselves. Around noon, on the advice of a lawyer, the landowners hosting the sit-in revoked the protesters’ permission to be there. Sheriff’s deputies came with a cherry picker on a flatbed truck to remove the protesters from the trees. When other protesters blocked the truck, deputies warned them to get out of the road and then began firing pepper spray into the crowd. Ms. Singleton was unable to get out of the road in time and was hit in the face with the spray. After the police had left, protesters sat her in a wheelchair on the shoulder of the highway and dabbed her eyes with milk of magnesia to alleviate the burning. Sheriff James Campbell, of Cherokee County, said tha pepper spray was used because the driver of the cherry picker was “scared out of his wits” that protesters would pull him from his vehicle. A TransCanada spokesman said the company had nothing to do with the police actions. bleedingheartyankeeliberal - I should have a t-shirt made. I'm hugely indebted to the Teamsters for being able to live among the 1%. Before the last of us lucky ones become extinct, I'm volunteering with the LAUSD's Collective Bargaining Education Project. I'd actually like to get a little 'press' for the program. I believe 'Union' needs to be the word on the street. I'm talking high school kids. This entry was posted in Cataloged Recent Posts. Bookmark the permalink.